Since its debut in August 2011, Bootstrap has become by far the most popular framework for empowering and enhancing frontend web design. With version 4, Bootstrap reaches an exciting new milestone, a lean code base optimized for modern browsers. Bootstrap 4 introduces a wide range of new features that make frontend web design even more simple and exciting. So, if you're interested to unearth the potential of Bootstrap 4 to build highly responsive and beautiful websites using modern web techniques, then you should surely go for this course. Learn out how to make your websites responsive. 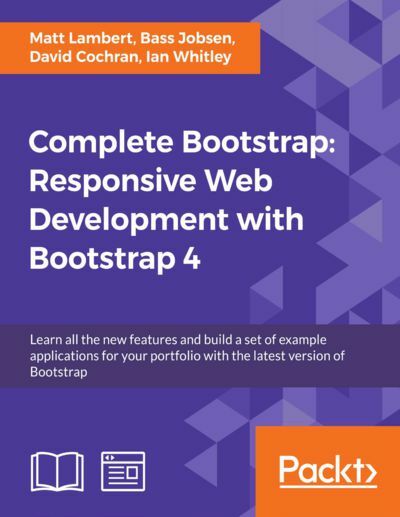 Explore the robust features of Bootstrap 4 and create exciting websites through excellent hands-on projects. Find out how to extend the capabilities of Bootstrap with a huge range of tools and plugins, including jQuery. Customize your designs by working directly with SASS files. By the end of this course, you will able to build amazingly beautiful and responsive websites with Bootstrap.